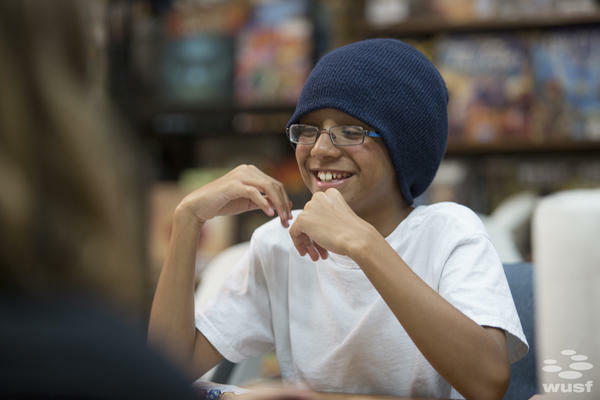 13-year-old Hena Rogers laughs during a recent game of Dungeons & Dragons at Emeralc City Comics in Clearwater. Matt Fahy is a licensed mental health therapist with he Holistic Mental Health Clinic in St. Petersburg. He's leading a series of roleplaying games that reimagine group therapy. 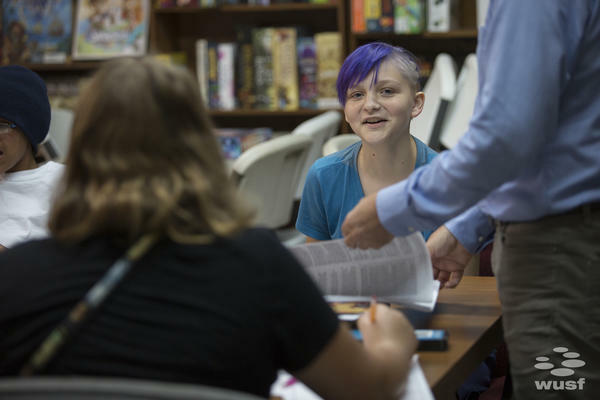 11-year-old Zoe Marlin creates her character for the game. You choose a a race, class, and alignment, then roll dice to determine traits and abilities. 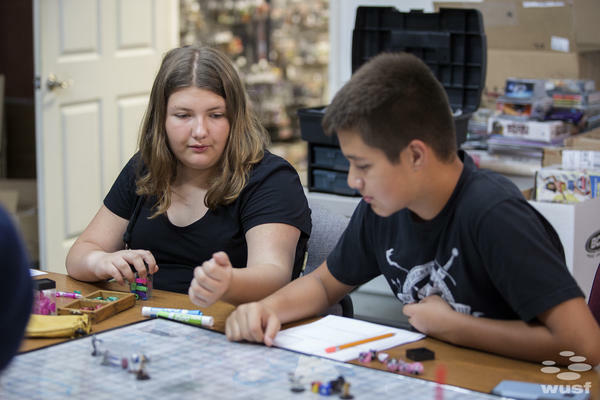 Matt Fahy says therapy already uses roleplay, but roleplay gaming makes it more fun and creative, especially for kids. 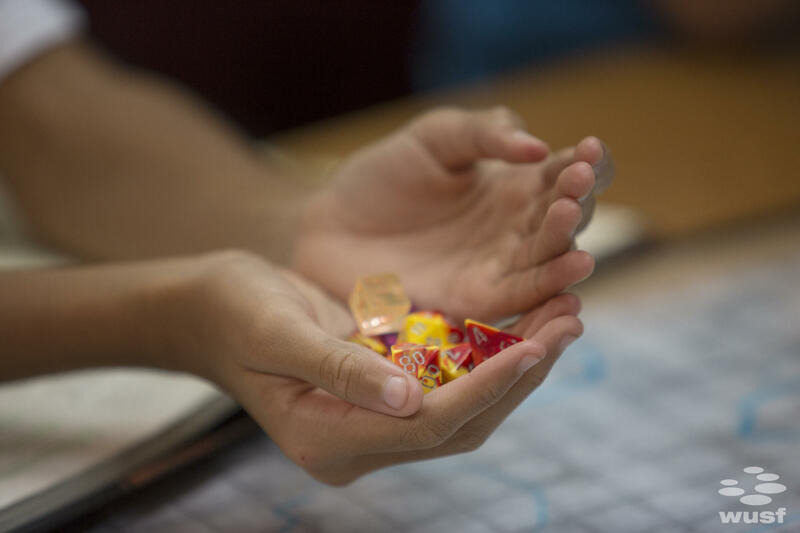 Players use dice to create their characters and determine the outcomes of their chracters' actions during the game. 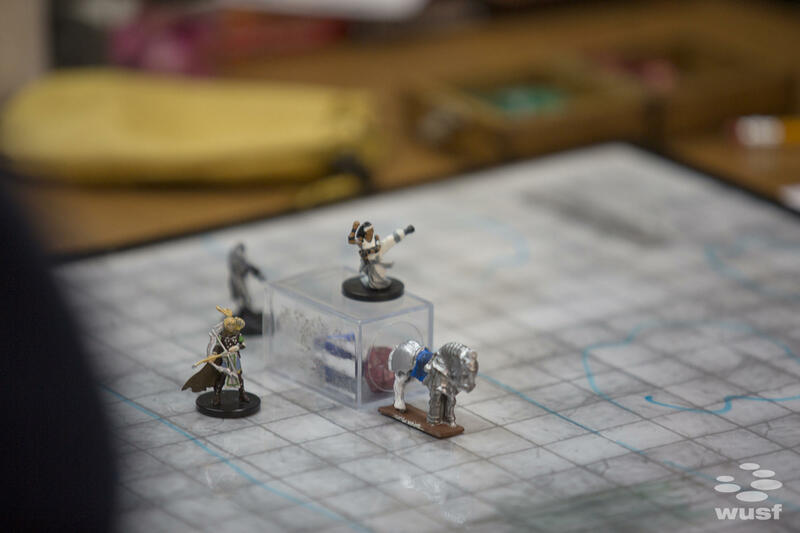 Sometimes Dungeons & Dragons games use miniature figures to represent players' characters. Zoe Marlin, 11, laughs during a recent Dungeons & Dragons game in Clearwater. Maxine Fahy, 13, left, joined in on the pilot game to support her dad, Matt Fahy. Brenten Glass, 12, plays alongside her. 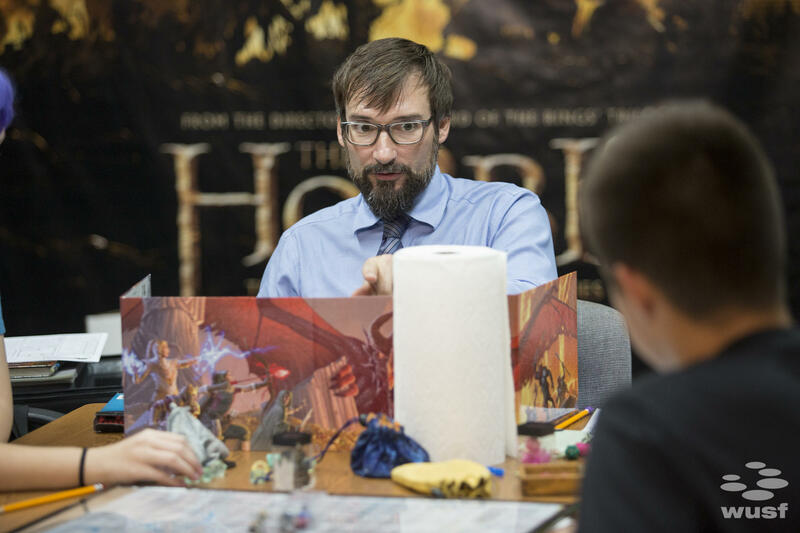 Matt Fahy is a therapist, but during the game, his role is called the "Dungeon Master." 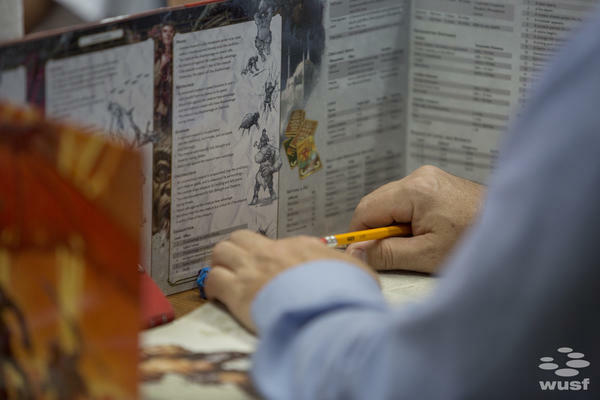 The DM guides players through a a pre-written adventure that changes with the players' decisions. The DM rolls dice and makes notes behind a screen so that the outcomes of battles and quests is secret until he chooses to reveal them. 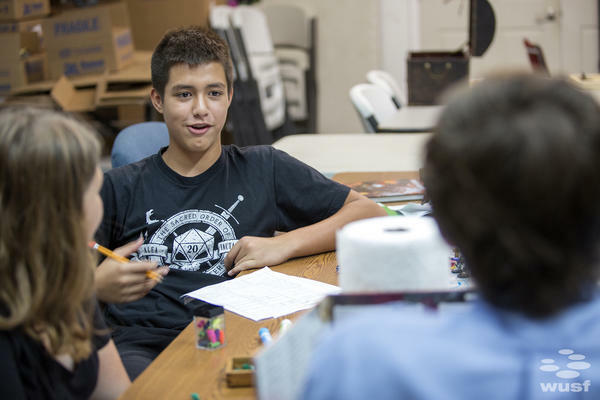 Brenten Glass, 12, was one of four players at the inaugural Dungeons & Dragons group therapy session. 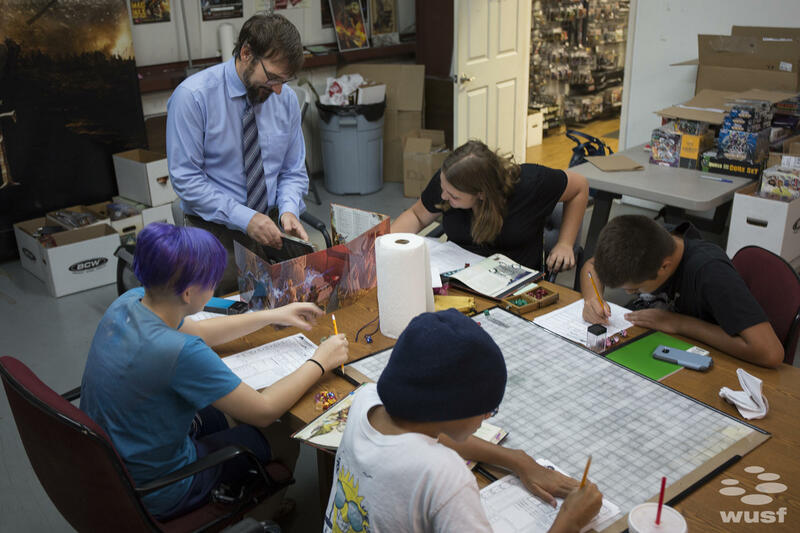 Role-playing games like "Dungeons and Dragons" have risen in popularity in recent years, even being featured on hit shows like Netflix's "Stranger Things." But a Tampa Bay area mental health therapist is putting a new spin on it. In the back room of the large warehouse-style building that houses Emerald City Comics, Matt Fahy doodles on a whiteboard that has been laid across a long table. Hena Rogers, 13, squints at his squiggles. "Are these all buildings or are they large footprints for a dinosaur?" Hena Rogers asks. "These are trees,” Fahy replies. Fahy and the small group of 11 to 13 year olds don't know each other, but came together in Clearwater to play Dungeons & Dragons, a role-playing game created in the 1970s that lets players go on an adventure through fantasy worlds inspired by mythology and J.R.R. Tolkien's Lord of the Rings. 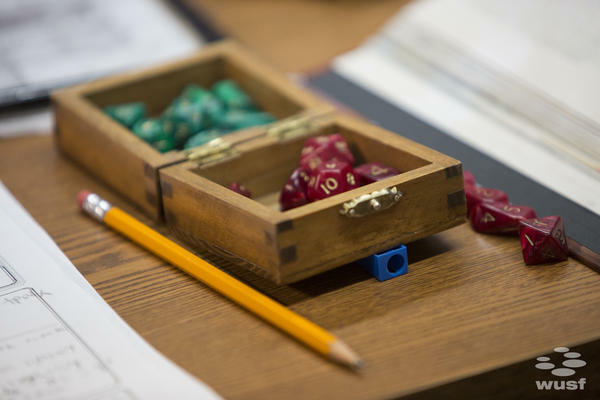 You roll dice to create characters, choose traits and weaponry, and weave together personalities and back stories. But this isn't your ordinary Hobbit and dragon-filled game. Tonight, Faye and the kids are launching a pilot program aimed to redesign how mental health counselors approach group therapy. He said traditional role-play is dry, and doesn't always appeal to children. "[The therapists] are like, 'Talk to the bully at school. I'll be the bully.' And then that just stops there. The kid just looks at you and they don't want to go any further,” Fahy said. “Whereas you say, 'An orc comes into the bar and he stars arguing with you about how you stole his coin purse. What do you do?' Now the child has to think, 'How do I talk to this orc without him hurting me?'" Fahy said kids with behavioral disorders, anti-social traits, and those who are on the autism spectrum, find Dungeons & Dragons role-playing particularly helpful. That's why Fahy's employer, the Holistic Mental Health Clinic in St. Petersburg, supports it. The clinic's Chief Financial Officer, George Nelson, steps away from watching the game to say it's gaining popularity across the country in the form of nonprofits, after school programs, some prisons, and private therapy. "Gaming is a big thing and it's very popular and children love to play,” Nelson said. “And hey, everybody needs help. Why not try negotiating with the dragon instead of trying to kill him?" Fahy's program was influenced by the Seattle-based Wheelhouse Workshop, which was founded in 2013 by two licensed therapists to help teens build their social skills. Several other groups, like the Pennsylvania-based Bodhana Group, also advocate for this "play therapy." 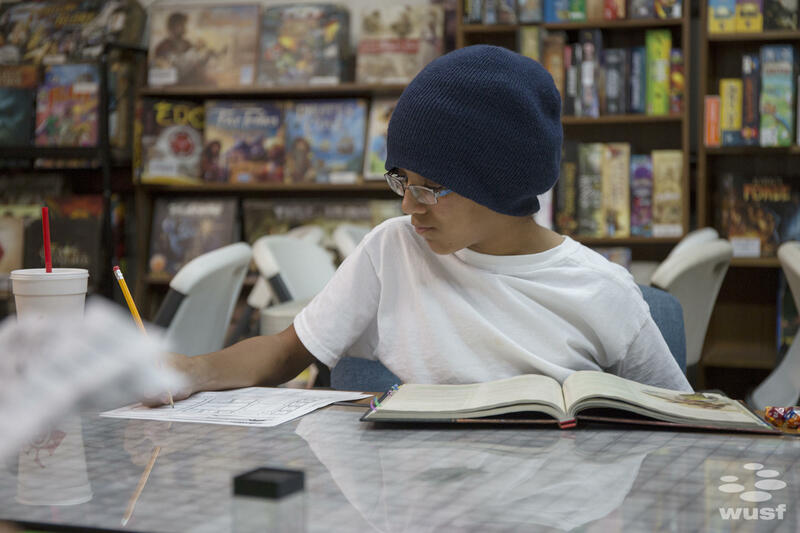 They say board, card, dice, and role-playing games "all inherently provide the opportunity to build skills such as reading, writing, arithmetic, socialization, manual dexterity, deductive reasoning, etc." 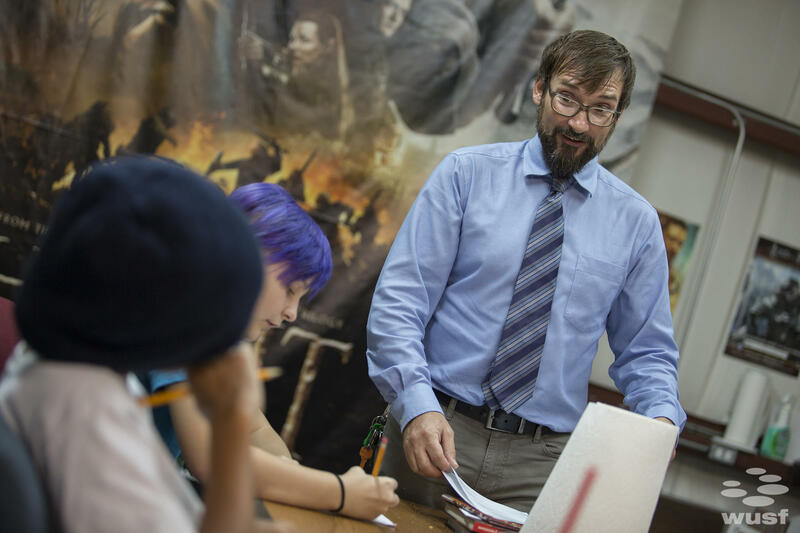 According to their website, "Role playing and storytelling games provide a nurturing and safe environment where people can work through trauma, anxiety, and other emotional issues." That’s why 13-year-old Hena Rogers is here. Her dad, Sean Rogers, is watching her play. He said Hena has struggled in new social situations. "I've just noticed that's she's doing a really good job of completely interacting with everybody and just being more forceful and forward and being more out there,” Sean Rogers said. “And that's just nice to see instead of seeing her hide inside of her shell." Most families taking part find that insurance won't cover this group therapy. Instead, they're paying $100 dollars a session for a three-hour game. For those who can’t pay outright, Fahy’s clinic has some payment options. They also bundle six sessions together for $500, and it’s free for a second child to join in on the game. Many families find it’s worth it. By the end of this game, Hena Rogers and her teammates are shouting and laughing, not realizing it's therapeutic. After a dice roll, Fahy continues the story. The table erupts into laughter. Hena , with her short cropped, purple hair and easy smile, becomes a little more reserved after the game is over, but admits she enjoyed it. "It's really fun. It's my thing,” she said. “I really like Lord of the Rings and Skyrim and all that." The four kids pack up their dice, put away the miniature figures representing their characters, and get ready to head out. Fahy tells them he's impressed. Next time, the adventurers, still under the guise of group therapy, will rescue their dwarf friend from the goblins that kidnapped him.